First choice in guitar repair shops. Stewart-MacDonald super glues feature incredible bonding strength for quick jig-making, repairs, fretting, binding, inlaying, finish touch-ups, nut slot rebuilding, and countless other tasks. They'll speed your work by hours. With our three clear viscosities, plus pre-mixed black and NEW amber medium super glues, you'll be ready for any repair situation that demands a fast permanent bond. Spend less time setting up clamps and waiting for other glues to dry! NEW 1-ounce bottles are the practical size to minimize shelf life problems. Bonus: three flexible Whip Tip nozzle extenders are included, too. Put super glue precisely where you need it, with no mess. #10 Thin penetrates close-fitting wood joints and fingerboard cracks. It cures in 3-5 seconds, for a strong moisture-resistant joint. This water-thin super glue is great for fast minor drop-fill repairs on guitar finishes, too. 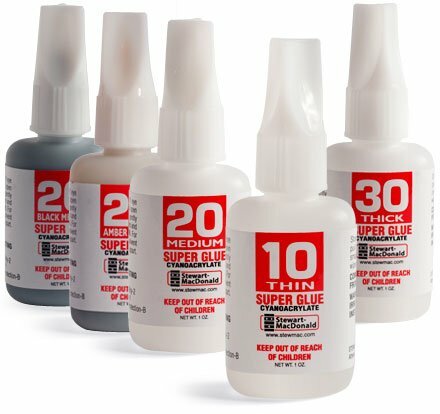 #20 Medium is our general-purpose super glue. It's a bit thicker, to fill small imperfect joint gaps, and cures in 10-25 seconds. It's also available in pre-mixed black and amber, real time-savers for ebony inlay work and touch-up repairs in aged lacquer finishes. #30 Thick has epoxy-like gap-filling consistency, and cures in 30-50 seconds to allow joint repositioning. To help prolong shelf life, store super glues in a cool dry place. Warning! Super glues bond skin and eyes instantly. Use in a well ventilated area. Keep out of the reach of children.